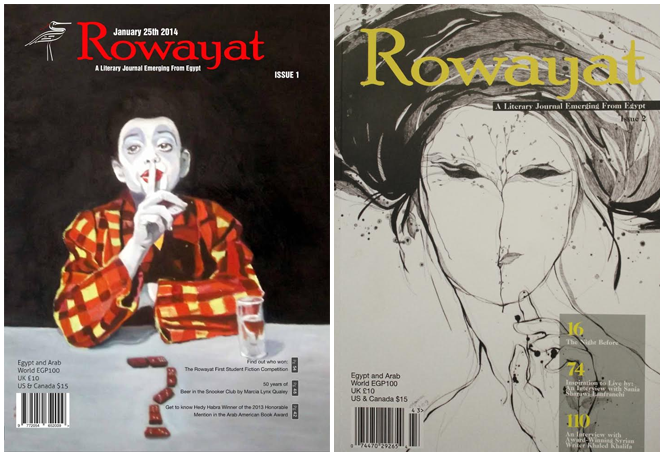 Rowayat is the first English Language Literary Journal in Egypt. We are innovative, ground breaking, cultural leaders with an aim to become the Paris Review of Egypt. Rowayat is a 170-250 page quarterly journal, designed in size B5, showcasing submissions from established, award winning writers, as well as emerging writers. Our vision is to create a space, where unequivocal English literary work by Egyptian writers is brought under the spotlight. Rowayat is the vehicle that catapults the writers of this generation to center stage, allowing them to freely express themselves. Rowayat is a constant reminder that we have a voice, a voice worthy of being heard. Rowayat not only welcomes Egyptian writers and foreign residents, but also Egyptians living abroad. This journal will feature and highlight original works of fiction, enabling future Egyptian writers to read, reminisce, comprehend and get a glimpse of what it is like to live and write in Egypt today. Fiction is where there are no shackles against opinions, where freedom exists in its purest form. There is no lobbying, there is no compromise. Fiction is where -Cavafy (born & raised in Egypt) told us it’s about the journey not the destination. 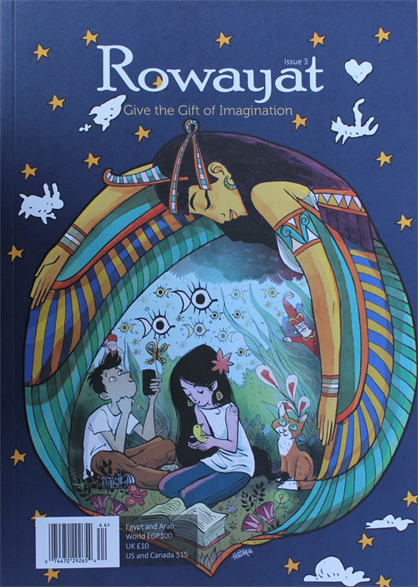 Through fiction and art, Rowayat aims to cross boundaries, bring us closer, unite the past, present and future writers emerging and resurrecting from Egypt. We are here, we’ve always been, we shall be, ever present. The budding writers of the student competition are an insight into our future. The tribute to Ahmed Fouad Negm, is a window to contemporary Egypt, Jacqueline Kahanoff into our past. You can’t understand Egypt or Egyptians from newspaper headlines, but you can come into their homes, and hearts through their writers. Rowayat Limited is a Registered Company in England and Wales, our Registration Number is: 08729840. Rowayat is registered for Corporation Tax, and our HMRC Reference Number is: 68469 1572. Distribution: We aspire to expand our international distribution to the US, Canada and Europe. Rowayat promises to engage Arabs and grasp the attention of non-Arabs interested in the Arab World. For those interested in advertising with Rowayat, we offer five prominent spots; including two inside pages, back cover, inside front cover, and the inside back cover. Rowayat has no political or religious affiliation. Copyright © 2014 Rowayat Limited. All rights reserved. Unless otherwise noted, the contents of this publication are the copyrighted property of Rowayat Limited. Use may be made of these pages for non-commercial purposes without permission from the copyright holder. All commercial use permission requests must be made in writing to Selachii LLP, 131c, Kensington Church Street, London, W8 7LP. ‘Rowayat‘ is registered in Great Britain as a Trademark. The Rowayat logo is a registered Trademark. No part of this journal may be reproduced, stored in a retrieval system or transmitted by any means without the written permission of the publisher. Rowayat cannot accept responsibility for any unsolicited material or transparencies. Rowayat is fully independent and its views are not necessarily those of any mentioned herein. All the art is contributed by our featured artist and cannot be replicated. Rowayat Literary Journal has no official waiting period before an authored reprinting of Work may take place, because we feel this places an undo limitation on the Author. However, we ask that all reprints include attribution.